Are you interested in tracking internal links with Google Analytics? This guide will show you 3 different ways to track your internal site links, so you can make sure to optimize your site for your visitors and get them to your most valuable content. After reading this guide, you’ll know how to track internal links with Google Analytics. Do not use UTM parameters. UTM parameters are intended for usage with external links. For external links, use our URL builder to add UTM parameters available right in the WordPress dashboard with any of our paid packages. In this guide, we’ll show you three different methods track internal links with MonsterInsights and Google Analytics. 1. User Flow in Google Analytics. 2. Setup Enhanced link attribution, and then use the page Analytics by Google (GA Chrome Extension) and navigate to the page. 3. Track your most crucial Call-To-Action with Events Tracking by setting up onClick events. How to Track Internal Link Clicks with Users Flow in Google Analytics. With the User Flow panel in Google Analytics, you can see the most common paths your users are taking on your site. Navigate to: analytics.google.com and go to Audience » Users Flow. Green boxes: They represent pages and display URLs. Curved gray lines: They represent visitors flowing from page to page. The thicker the line, the more users follow that path. Red lines (drop off): They represent the percentage of visitors that exit the site after visiting that page. Dimensions: The default dimension is country. You can change the dimension as per your requirement. You can even set it to the custom dimensions you’ve set up with MonsterInsights if you’re using our Custom Dimensions Addon. 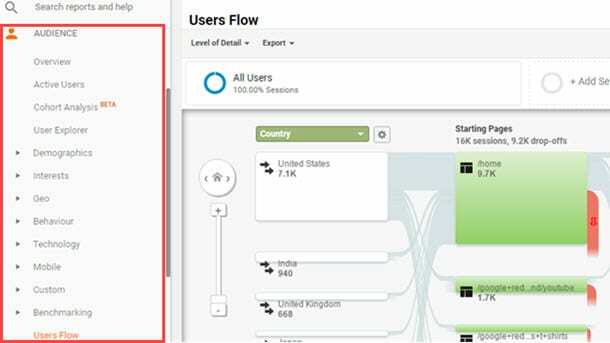 Please see our guide for more details on how to do a user flow analysis for your site: How to Conduct a User Flow Analysis in Google Analytics. 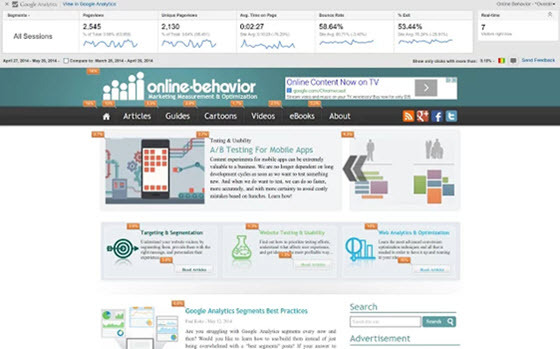 Setup Enhanced Link Attribution, and then use the Page Analytics by Google (Google Analytics Chrome Extension) navigate to an actual page on your site. The results show an easy-to-understand, heat-map-like visual representation of the clicks of each page on your site. Please see our guide for an in-depth examination of how to set this up: The Beginners Guide to Enhanced Link Attribution in Google Analytics. To track internal link clicks with events tracking please see our guide on adding custom link attribution: How to Add Custom Link Attribution: Setup Custom Link Categories, Labels, and Actions. Are you interested in learning how to connect your site to Google Search Console so you can get better stats on how your site is showing up in Google Search? Then please see our guide: How to Connect Google Search Console to Google Analytics.